While walking the grounds of my company’s experiment station in Fontezuela, Argentina, I encountered a massive European elm (Ulmus laevis)—its trunk enveloped by an unidentified woody vine with large, ball-clusters of small, green flowers. Despite their inconspicuous appearance, the flowers were highly attractive to insects, primarily honey bees and smallish, black and yellow vespid wasps. One of the wasps caught my attention—it was not quite as narrow as the others, and it flew a little differently. Closer inspection, of course, revealed that it was not a wasp after all, but rather a fly. I wasn’t sure what it was, but it was extremely flighty and wouldn’t allow me to get close enough even to attempt looking at it through the viewfinder—much less going for a composed shot. Now, if it were a tiger beetle I’d probably spend the next 2 hours “working” it to get that in situ shot. But, hey, it’s just a fly (with apologies to my dipterist friends)! I trapped it in a vial and collected some flowers and foliage from the vine with hopes of giving it a day or so to settle down enough to allow a few photographs in a more controlled environment. Among flies, tabanids and syrphids seem to get all the attention from insect photographers because of their contrastingly colored eyes, but this fly had every bit as much eye as those better known families! Considering how broadly across the order Diptera that one finds these stunningly patterned eyes—72 species out of 23 families according to Lunau & Knüttel (1995), an obvious question is what is their purpose. Considering that the patterns and coloration are often sexually dimorphic, it’s tempting to think it has something to do with mate selection, especially with their large size and resulting prominence. However, Horváth et al. (2008) presented evidence that the ventral eye surface of many tabanids are stimulated by horizontally polarized light. Such capabilities are common in aquatic insects, suggesting some function in locating water for finding hosts, mates and suitable sites for laying eggs. This still doesn’t explain why the patterns are often sexual dimorphic, although one can imagine that males and females experience different selective pressures for specific visual cues that could have an effect on the resulting color pattern. Comments from any dipterists that happen by this blog and have greater insight into this question would be greatly appreciated. Horváth, G., J. Majer, L. Horváth, I. Szivák & G. Kriska. 2008. Ventral polarization vision in tabanids: horseflies and deerflies (Diptera: Tabanidae) are attracted to horizontally polarized light. Naturwissenschaften 95:1093–1100, DOI 10.1007/s00114-008-0425-5. Lunau, K. & H. Knüttel. 1995. Vision through colored eyes. Naturwissenschaften 82(9):432-434, DOI: 10.1007/BF01133678. This entry was posted in Diptera, Stratiomyidae and tagged Argentina, entomology, flies, insects, nature, science, soldier flies, vision. Bookmark the permalink. 15 Responses to Fly got eye! Time in the field, my friend – time in the field. At the moment, my field is still white! Woe is me! Ha, yes – well I guess I do have an advantage being able to use both sides of the equator! You might try cooling the specimen for a little while to slow them down. As they warm up they will look quite natural. 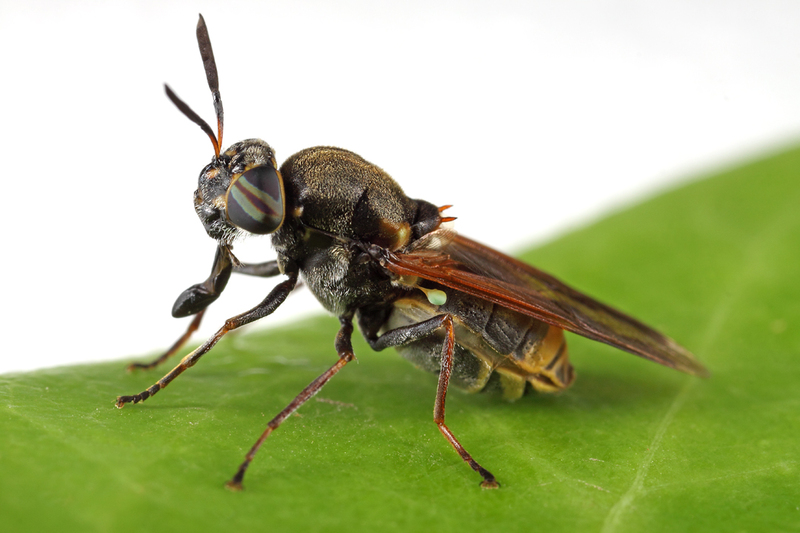 I’ve never been happy with the look of cooled insects – there’s always a bum leg and a dead look in the face. They need to warm up enough; of course you won’t be left with much time to take photos. Very interesting. Good shots also. Looks like dangerous little madam! Would it bite you to get blood or not really? 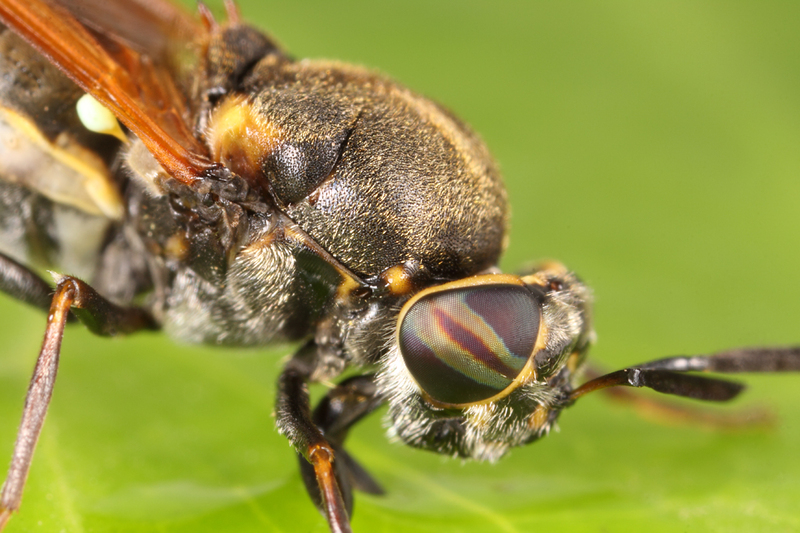 These flies cannot bite – they only feed on flowers. Their dangerous looks are to fool predators. Thanks for posting! I photographed a similiar looking fly in Massachusetts (in the backyard) last year. I figured it was a Syrphid fly but hadn’t gotten around to identifying it. Now I have a better place to start! Yes, sometimes syrphids and stratiomyids can be a little confusing. Hope you figure out which yours was. We have similar mimic soldier flies up here (as you no doubt do in MO) in the genus Stratiomys. Dull eyes, though, but not at all flighty – rather arrogant in their false colours, as I remember, and easy to approach.